Use promo code “GRINDERS” when you sign up for Draft! Let’s take a more in-depth look at DRAFT with this review. Originally founded in 2014 from the team that brought StarStreet to the DFS landscape, DRAFT is headquartered in New York City with Jeremy Levine (CEO), Jordan Fliegel (CEO) and Nicolo Giorgi (CTO) leading the way. After raising $3.5 million in capital in 2015 the company was acquired by industry giant Paddy Power Betfair for $48 million in May of 2017. The company focus has always been to build a game that could be completed quickly and on the go – something not always viable with typical daily fantasy sports contests. They also quickly realized that one of the favorite things people loved to do when it came to fantasy sports was drafting the players and thus their emphasis went to creating a game that would embrace the draft. In early 2018. DRAFT received the Fantasy Sports Trade Association’s Award for Best Daily Fantasy Sports Game and Fantasy Business of the Year. 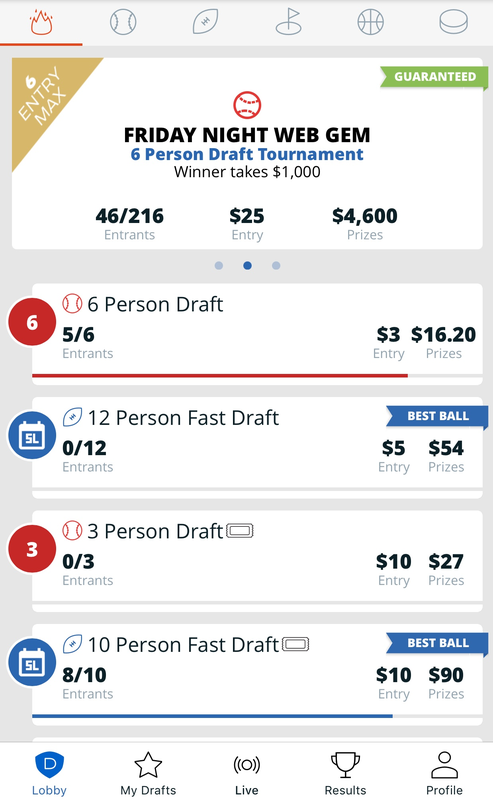 DRAFT has a state of the art mobile app that received the 2017 FSTA award for Best App – Games as well as the award for Best Draft Room beating out the likes of industry giant ESPN for top honors. In addition, they have a fully functional website that allows you to do everything that you can do on the mobile app. 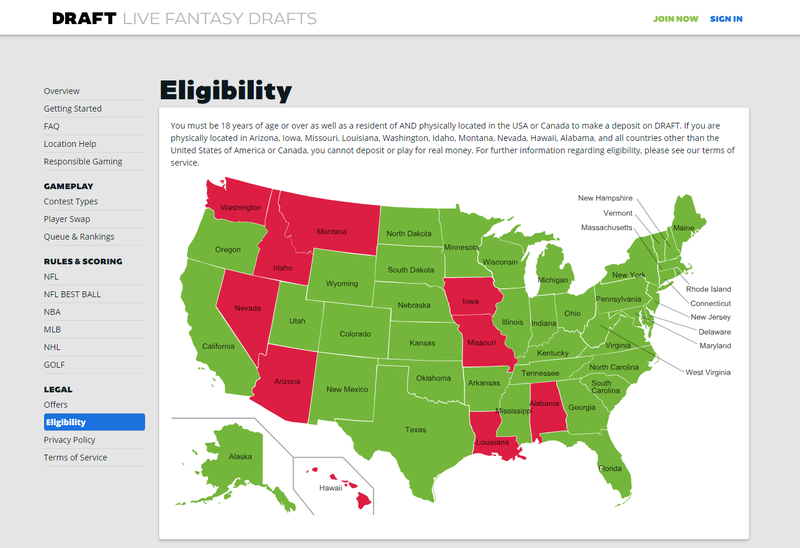 Once on DRAFT, you can select the sport you wish to play and filter contests based on type of game and entry fee. You can also access your history easily through your profile as well as deposit/withdraw money with the click of a button. There are also sections on how to play, rules of the game, and information for contacting support. While the app is award winning, it has not gone entirely problem free. There have been several crashes/lags that resulted from massive player swaps right as contests were about to start for the day. To their credit, DRAFT was quick to provide amicable financial resolutions to all parties involved and garnered a lot of respect industry wide. 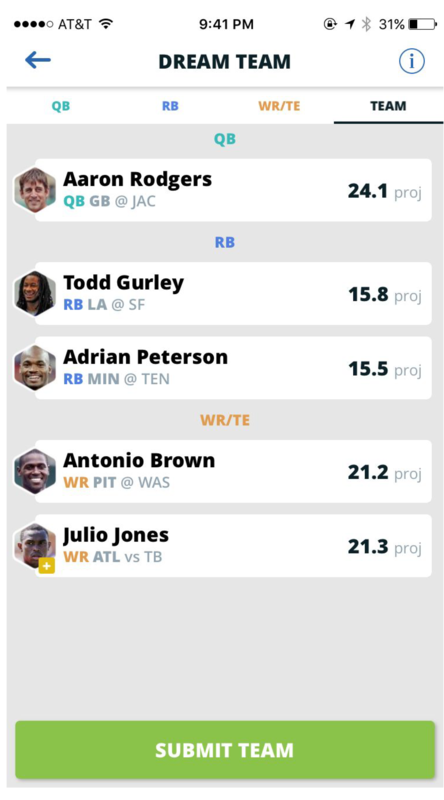 DRAFT offers contests that are unique in the daily fantasy sports industry. While there is moderate competition for their best ball leagues (more on the different types of games DRAFT offers later in this review), none can offer the convenience or speed with which DRAFT can not only fill contests and get a person drafting, but also get a draft finished so that a person can move on with their day (or to the next draft). 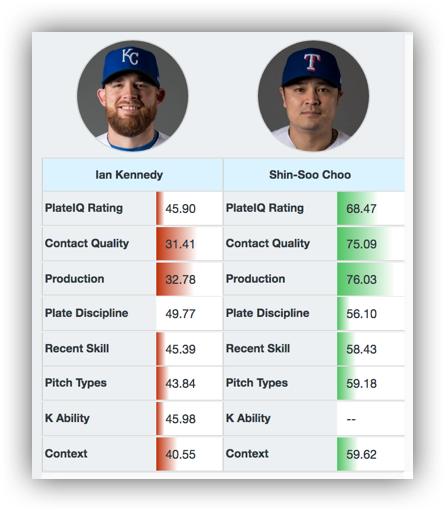 With their mobile app, they also have a leg up on the other best ball providers who typically operate solely via a typical website. In respect to their daily snake draft contests, there is no competition. DRAFT has established a stranglehold on the industry in this corner of the market. The site is careful with any specificity in regards to security stating “no data transmission over the Internet, mobile networks, wireless transmission or electronic storage of information can be guaranteed to be 100% secure. Please note that we cannot ensure the security of any information you transmit to us, and you use our Service and provide us with your information at your own risk.” The do add that they utilize industry standard, Secure Socket Layer (SSL) encryption technology to help prevent unauthorized users from viewing or manipulating personal information. It is easy to both deposit funds and withdraw your winnings at DRAFT. Withdrawal can be done either through PayPal, credit/debit card, or e-check with PayPal deposits the quickest method to getting your money. All withdrawals are processed manually with PayPal taking place within 48 hours and other forms taking between 3-5 days. If you sign up for DRAFT using the promo code GRINDERS you’ll receive a free $3 entry into a DRAFT contest. 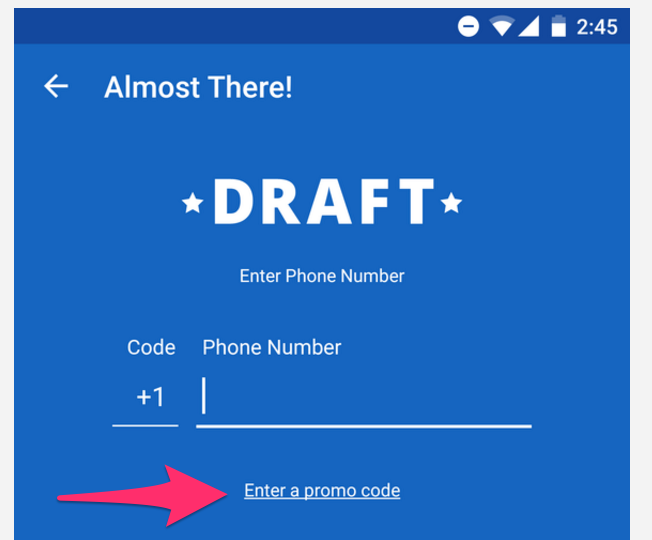 If you sign up for Draft using one of our links, promo code “GRINDERS” will already be populated. Iin 2017, DRAFT held their first NFL Live Final in conjunction with the RotoGrinders annual DFS party in Nashville, TN. The 10 person, $100,000 prize pool event was a huge success and included some of the best players in all of DFS including RG’s own Cal Spears and Eric Crain. Contests are offered on a regular basis for all the major sports (NFL, MLB, NHL, and NBA) and DRAFT recently launched PGA contests as well. These contests are not your typical salary cap type contests you will find on other DFS sites. Instead, they are draft contests with different formats for the types of drafts you want to partake in. We’ll explain each of these below. Snake Drafts are the most popular form of season-long drafts and now you get to enjoy them while playing daily fantasy sports. In a snake draft, everyone takes their turn picking and the order “snakes”. For example, in a 10-person draft, the person with the 10th pick (the last pick in the first round) would also have the 11th (the first pick in the second round). Head-to-head (H2H) snake drafts are self explanatory once you get how the multi-person snake drafts work. In H2H drafts, you play against just one opponent. You can play against random opponents by selecting a H2H draft from the lobby or you can go to the “Friends” tab and challenge a friend. The H2H drafts are great ways to play DFS with a friend. Simply send them your draft link, search for their username and automatically challenge them. This a feature Grinders are sure to love. Look for the tile on the bottom of the DRAFT lobby that says “Enter Multiple H2H Drafts.” There, you can set your rankings and auto-enter drafts. DRAFT will match you up against all unique opponents and it will draft for you from your rankings. Even better, it drafts intelligently, so if your opponent has filled a position, it won’t draft that position for you until your last pick. This is an awesome way to get a bunch of action with next to no effort. Recently added to the DRAFT format lineup is the multi-player draft tournament. This mode combines the snake draft format with the tournament bracket format. The player pool is divided into smaller fields, with the winner of the draft moving on until a single winner is crowned. It’s a unique way to add the stakes of the various tournament modes with the snake draft format familiar to fantasy sports fans. Dream Team contests are a totally different type of contest on DRAFT. They may look more familiar to you if you’re used to salary cap draft. They’re essentially the same thing…but with no salary cap. Instead, you simply pick the five players you think will put up the most points and that’s your team. The Dream Team contests are run GPP style. They’ll pay out in full even if they don’t fill. Leagues are another cool feature on DRAFT. You can create a league, set up a draft and customize everything from the number of entrants, dollar amount and draft time. Then, you and your friends can do a draft every week throughout the season at that time. You compete weekly and are tracked on a season long leaderboard. Despite some initial growing pains, DRAFT has quickly emerged as an industry leader for snake draft type games. With an award-winning, easy-to-use mobile app, there aren’t many better DFS experiences in the industry. DRAFT gets our highest possible recommendation.